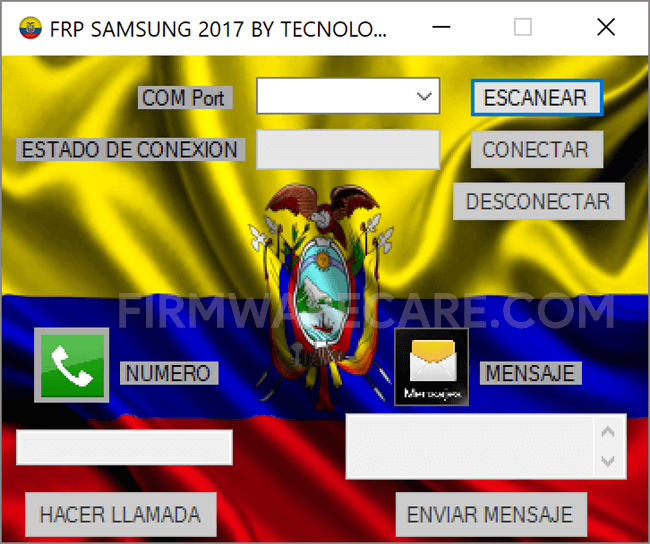 FRP Samsung 2017 is a small application for windows computer created by Hacer Llamada and Envair Mensaje, which allows you to remove the Samsung FRP Protection from the Samsung Smartphoen and tablets in few clicks. It allows you to scan the connected Samsung device using the COM port, Establishing the connection between the device and the FRP Tool. It allows you to unlock the Samsung FRP protection using the two methods i.e Calling the Number or Sending the Text Message. In order to use the FRP Samsung Tool, you need to install the Universal ADB Driver on your computer. Once you have installed the driver, you need to connect your Samsung device to the computer using the USB cable and make sure USB debugging is enabled. [*] Compatibility: The FRP Samsung Tool runs perfectly on Windows XP, Windows Vista, Windows 7, Windows 8, Windows 8.1 and Windows 10 (32 bit and 64 bit). [*] Credits: FRP Samsung 2017 is created and distributed by Hacer Llamada and Envair Mensaje (developer). So, full credits goes to Hacer Llamada and Envair Mensaje (developer) for sharing the tool for free.